How do we listen to music as critics? This question is the obvious subject of a chapter of Charles Rosen’s Piano Notes and also the unlikely denouement of Malcolm Gladwell’s Blink. Gladwell, famous for introducing The Tipping Point into general cultural use by his eponymous best-selling book, has written a sequel less socio-cultural and more psychological, devoted to those initial moments of judgment, when, in the blink of an eye, decisions are made. No doubt there is a simple biological basis for this – like other animals we are hard-wired, to use the jargon, to survive perils. Knowing what we feel and think is just a luxury version of swerving to avoid an oncoming car, or putting a hand out to break a fall; our instincts know what’s good for us. Love at first sight (or at least in speed dates), job interviews decided in seconds, the authenticity of artworks where a glance tells more than days of analysis; these are the examples of Blink. Gladwell’s argument is that instantaneous intuition far surpasses considered reasoning….except when it doesn’t. That is, a variety of prejudices (for example, in favour of tall, dark, handsome men) interfere with the ‘proper’ operation of intuition. Where museums have bought fakes, that has often been because they have been keen to improve their collections and therefore desperate to believe in the authenticity of their acquisitions. Moreover, intuitions are often disturbed by a requirement to articulate them. We can tell which jams we like in a tasting; asked to describe why, we become confused. The act of describing can completely reverse our true preferences. That is, unless we are jam experts, in which case we have become articulate about jam, and can be self-aware about our perceptions. Likewise, even if you can easily distinguish Coca-Cola and Pepsi, it is apparently much harder to say which is the odd one out of three glasses (2 coke and 1 Pepsi or vice versa)….unless you are a soft drink taster. Gladwell’s crowning example is that of orchestral auditions – by chance a number of historically famous examples were held behind screens, for example when one of the applicants was related to an orchestra member, and this ‘blindness’ was the sole reason why some ‘objectively’ best candidates (women for brass jobs) overcame traditional prejudices against the idea that women could not play big brass instruments. This is an ideal metaphor for Gladwell. The screens are what overcome prejudice and allow intuition to perform its true function of judgment. They separate, to quote the key remark in a famous strand of German philosophy, the criteria by which we judge, from the prejudices by which we misjudge (it reads better in German, where there is a pun on Urteil-Vorurteil). Gladwell’s proposition is extremely similar to what Charles Rosen, the greatest living musicologist, writes in Piano Notes. 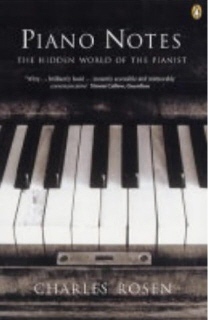 Rosen’s book is a thematic behind-the-scenes reflection on what it is to be a pianist, to perform, to record, to learn repertoire or to teach. It is a wonderful read, full of integrity and indubitable truth, although we occasionally feel, as is true also of Alfred Brendel, that he can be unaware of how the privilege of being famous allows a far more exigent –and Olympian- intellectual attitude. Why, asks Rosen, should a poor performance by a famous pianist be better received than a great performance by an unknown pianist? Not as unjust as it sounds, he reports. Because the determining factor is the quality of the audience’s attention, and when faced by a famous pianist, we defer to his reputation and pay that proper attention. As performers or expert listeners, we are too snobbish about the failings of poor performances, that yet give such pleasure. Great music, even played on an off day, can give great happiness still. The truest compliment to the artist is not applause, says Rosen, (some audiences are simply always enthusiastic), but the rapt, silent attention. These are all observations that apply saliently to the task of being a music critic. Both Rosen and Gladwell, in their different ways, express what is good about criticism (we can put into words, therefore communicate, what remain intuitions to others) and what is bad (we are not, even as critics, free from hearing what we expect to hear). I would hazard that if all CDs were reviewed ‘blind’ and piano competitions all held behind screens, the results and opinions would be significantly different. In classical music at least, where authority matters more than novelty, it is far easier to keep a name than to make one. To take the least contentious proposition – if a famous artist plays eccentrically, we afford him the licence of wondering why he has chosen that interpretation. A debutant pianist will be told that he has misunderstood the music. Indeed, novelty plays a different role – where popular music needs the next big thing - classical musicians turn to rare and unknown repertoire to avoid having to be up against Emil Gilels or the Amadeus String Quartet, or to avoid the inescapably exposed lines of Mozart or Bach, where the slightest blemish is punished. In other words, to sidestep criticism. There is no foolproof answer to this problem. Style, they say, is concealed originality, and in the best criticism, what is heard serves not only as material to be assessed, but also as a catalyst. A catalyst for insights into the theme or subject of the concert or recording, or into the music itself. We read John Carey, A A Gill, or Jeremy Clarkson not primarily to know whether we should buy, eat or test-drive the book, restaurant or car of the week, but for the pleasure of their fine writing. At the same time, they would certainly not claim to be W B Yeats, Marco Pierre White, or Michael Schumacher. Self-expression is the best criticism; art remains the best self-expression. And this is very much the editorial philosophy here at Musical Pointers.